Sir W.J COLLINS, k.c.v.o., md., ms., dl. P. M. EVANS, ll.d, j.p.
T. E MORRIS, m.a. ll.m., j.p.
J. O. MARSHALL ROBERTS, j.p.
Mrs. E. F. ROOKE, b.a. F. E. ROWETT, m.a., (cantab. ), d.sc.(lond.). 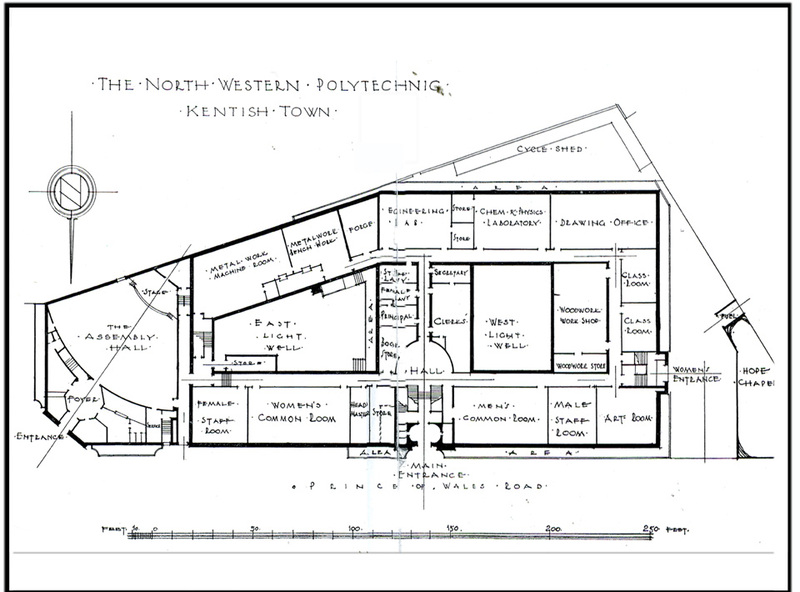 The north-western polytechnic is the last of the technical institutes of London to be inaugurated, and its erection completes the circle of institutions of the kind with which London is now provided. It was not included in the Central Scheme of 1891 copmpenplated by the City of London Parochial charities act of 1883, and although a scheme dated August 5, 1892, provided for the erection of such an institute within the parish of St Pancras, the project notwithstanding contributions from individual donors, hung fire for lack of funds. Meanwhile, however, the acquisition of a valuable site in Kentish Town was effected. The leasers on the site did not expire till 1910, and further postponement ensued during and in the years following the Great War. 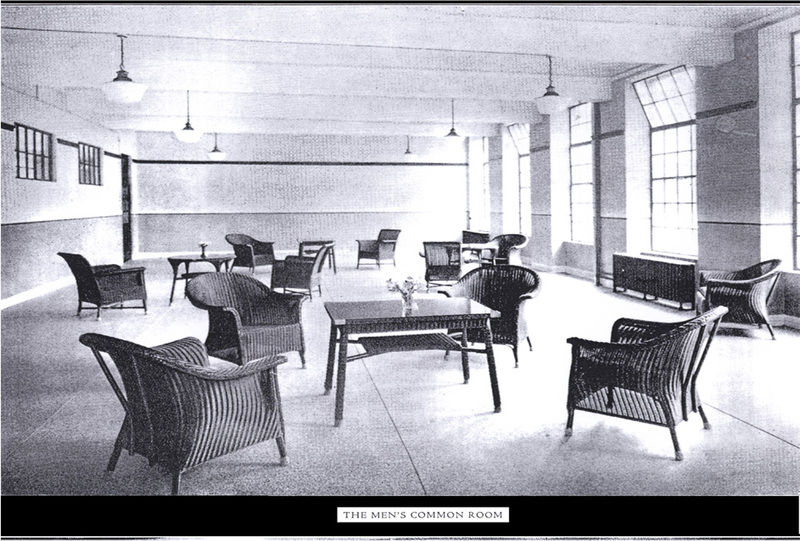 It was not until 1927, after many setbacks and disappointments, that the governors with the approval of the Board of Education and the Charity Commissioners, and with the generous assistance of the London Parochial Charities and the London County Council, found themselves in a position to invite tenders for the erection of the building. 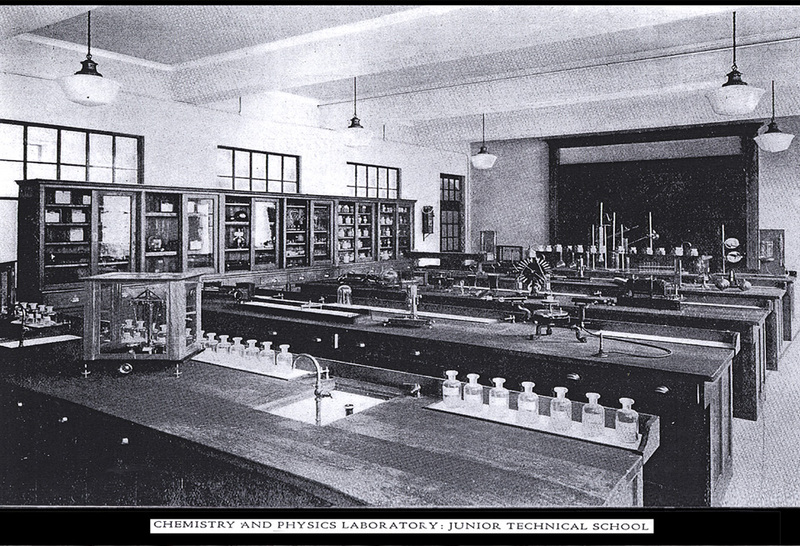 The scope of the work of the Polytechnic was the subject of much disscuion between the Governors and the London County Council. 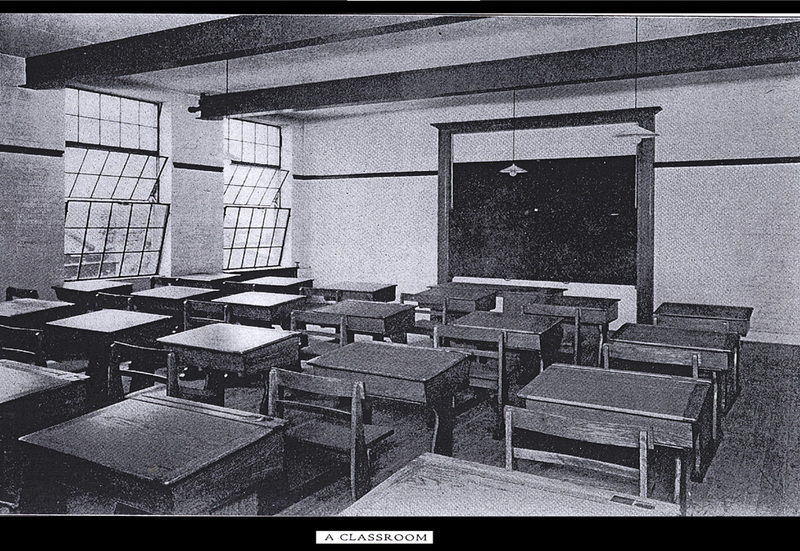 Originally it was intended that musical instrument making school should be of the chief subjects of instruction, but the County Council transferred that to the Northern Polytechnic. 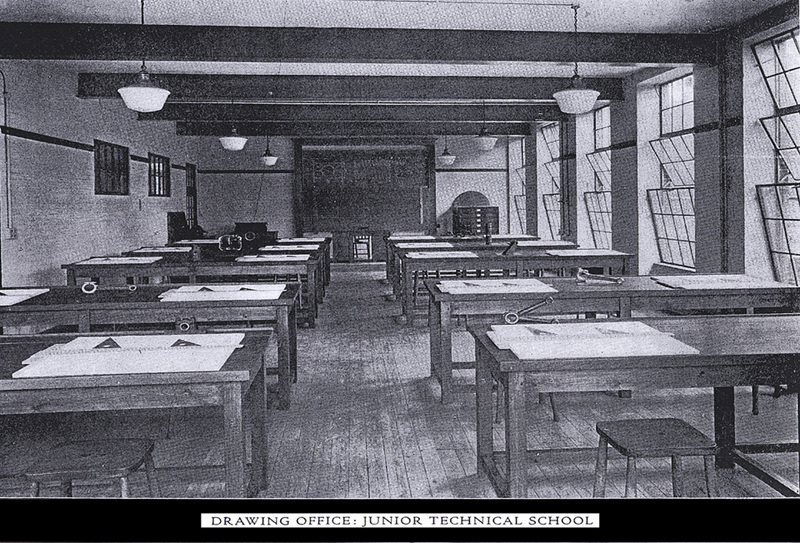 It was final agreed that the actives of the North-Western Polytechnic should include : (1) A Girls Day Trade School in Dressmaking, Tailoring, Embroidery and Cooking ; (2) A Day Junior Technical School; for Boys in Light Engineering subjects; (3) A Printing School ; (4) Cabinet Making, French Polishing and Upholstery ; (5) A Commercial Department ; (6) Day and Evening Classes for Women in Dressmaking, Millinery, Fashion Designing and Domestic Economy ; (7) Social and Recreative Activates, Gymnastics, etc. 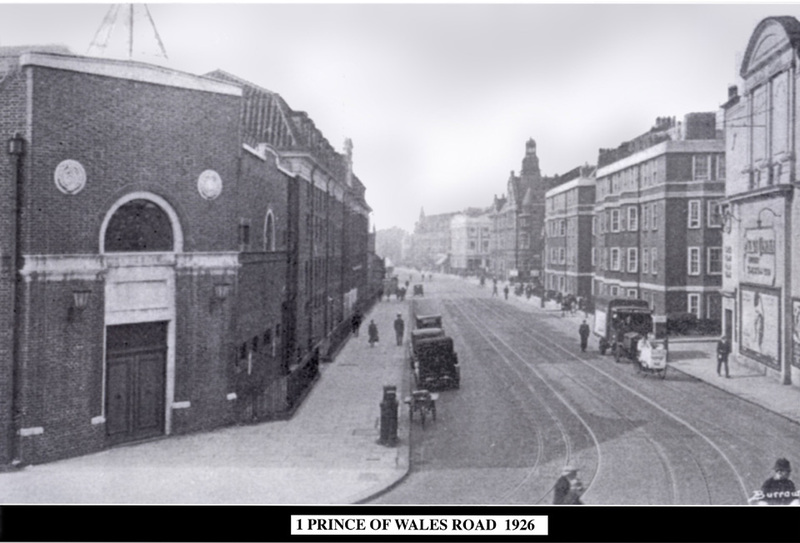 Due regards had been paid to the educational requirements of the district and the co-ordination of the work of the North-Western Polytechnic with that of other technical schools in London. The neighbourhood in which the Polytechnic is situated has many interesting historical associations. Kentish Town is reputed to be the oldest inhabited part of the parish of St Pancras; the name said to be a corruption of Cantaloews Town, so called after the noble family Cantilupe, famous in Church and Sate during the thirteenth century and to whom the establishment of an Episcopal chapel in the hamlet is attributed. The name of Cantlowes Town and of the family Cantilupe is also preserved in Ken Wood, now in part dedicated to the use of the public. King John had a Castle in Kentish Town, whose existence is recalled by the name of Castle Road, Castle Ward and the Castle tavern. Here too Henry of Bruges, Gater King at Arms, entertained the Emperor Sigismund at his magnicent mansion in 1416. Close by the village ran the Fleet River, once the resort of fishermen, as Anglers Lane reminds us, later an offensive ditch satirised by Pope but now covered in and converted into a sewer. Queen Elizabeth is said to have a hunting box or residence in Kentish Town, which subsequently became the abode of Neil Gwynne. Later Nelson, Lady Hamilton and Lord Erskine for a while lived in what was then regarded as particularly salubrious neighbourhood. 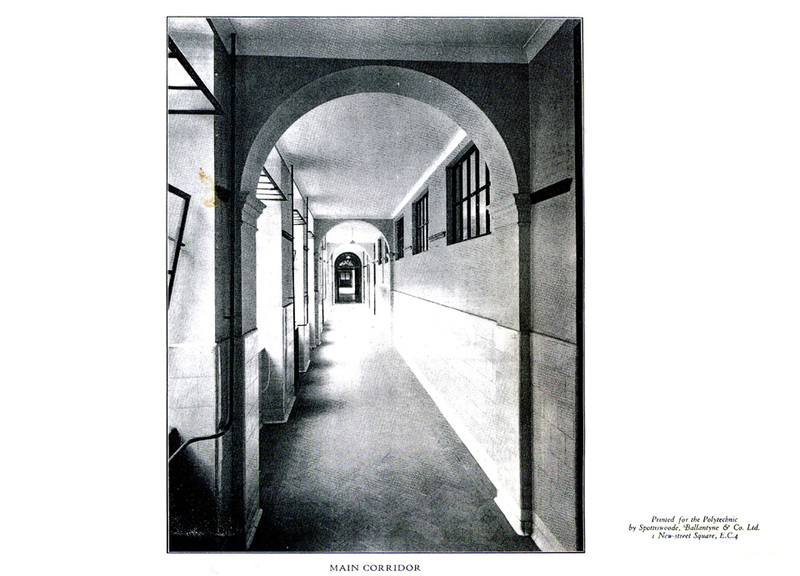 The general layout of the Building has been designed with the object of securing for the vacuous labourites and classrooms the maximum possible amount of light, sunshine and air. The building encloses two large light wells and spacious corridors give access to various rooms. In order to obtain as much light as possible “Borrowed Lights” have been provided in all classrooms and corridors. 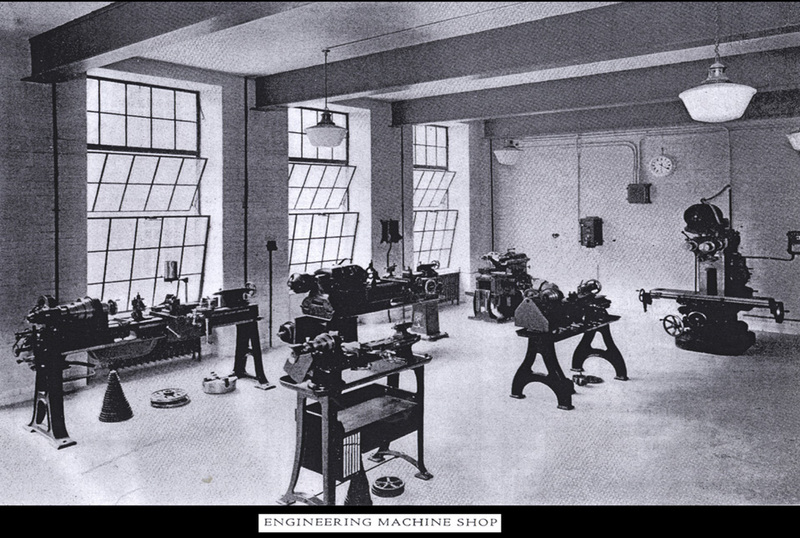 In the basement are the Hand and Machine Composing and painting Machine Rooms, and the accommodation required for teaching the various processes auxiliary thereto. 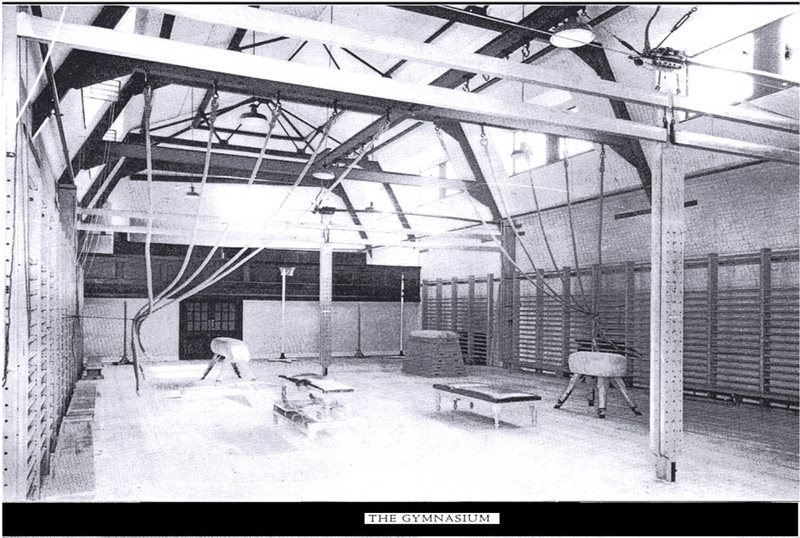 The School for Cabinet Making, Woodworking Machinery, Upholstery and French Polishing is also located in this part of the building. 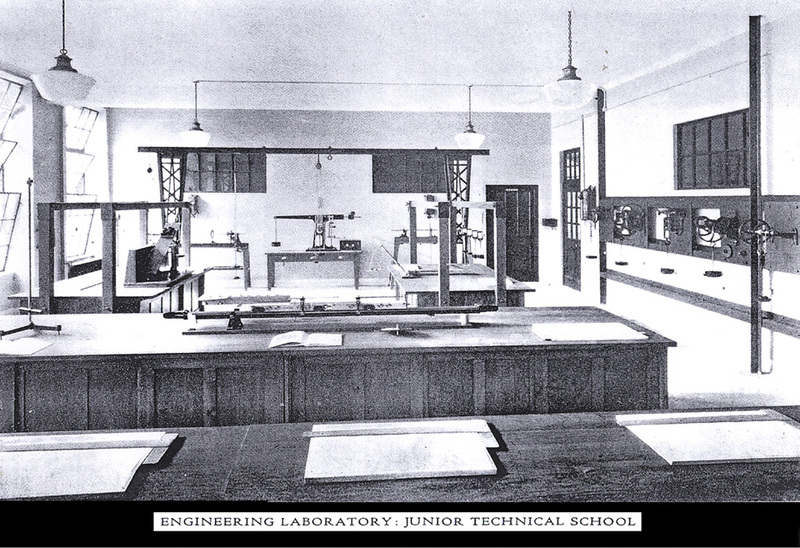 On the ground floor are the Chemical, Physical and Engineering Laboratories, Machinery Shop, Drawing Offices, Woodwork and Metalwork Shops, Forge Room, Art Room and Tool Rooms, constituting a Junior Technical School for Boys. The first floor, provided with nineteen classrooms, is mainly devoted to Commercial Instruction, which includes Bookkeeping, Accountancy, Law, Statistic, Economics, Road and Railway Transport, Shorthand, Type-writing and Languages. 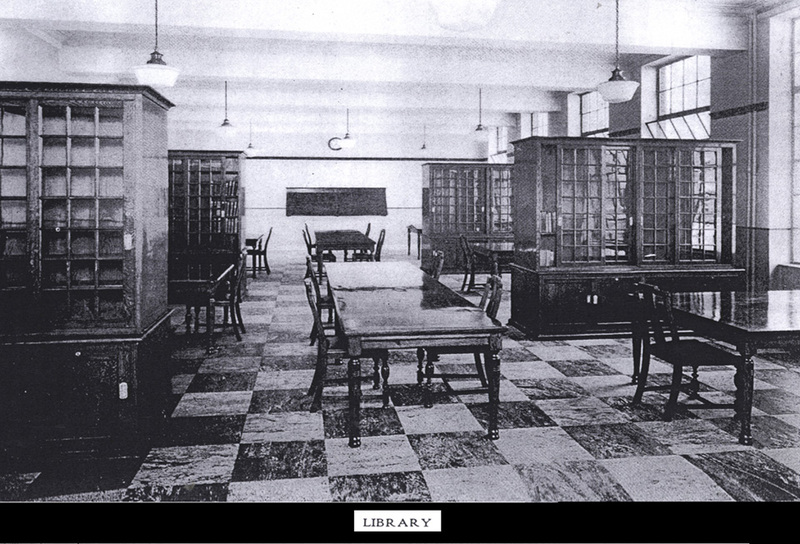 A library, a large Refreshment Room and a Cookery Service Room are also situated on this floor. 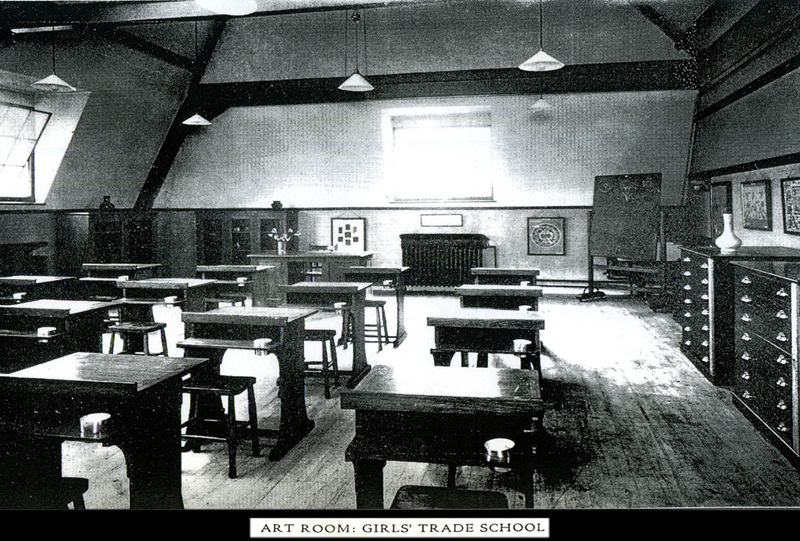 The Day Trade School for Girls and Day and Evening Classes for Women are accommodated on the second floor. 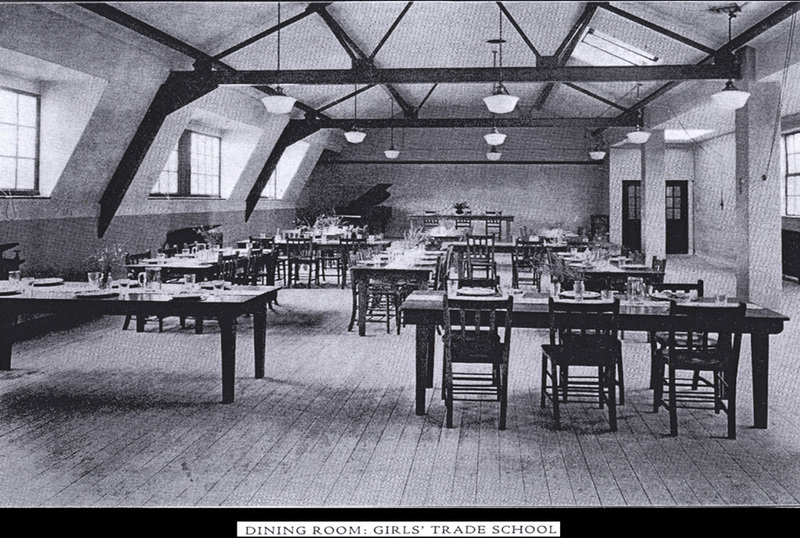 In addition to trade classrooms for Dressmaking, Tailoring and Millinery, there are Pantry, House wifely, Needlework and Art Rooms, Two Kitchens, English and History Rooms and a large Refectory. 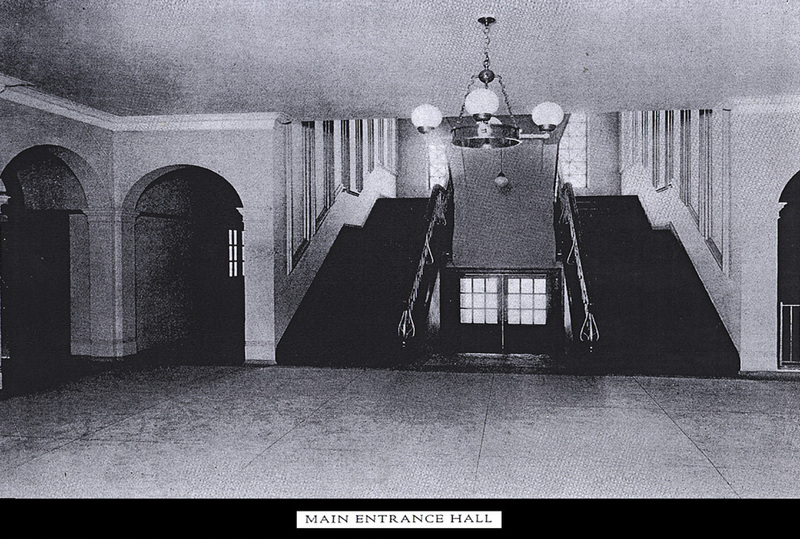 The main entrance in the centre of the building admits for the Prince of Wales Road, and has an imposing staircase leading to various floors, while there is a separate west entrance from the Prince of Wales Road for the girls and women’s departments. 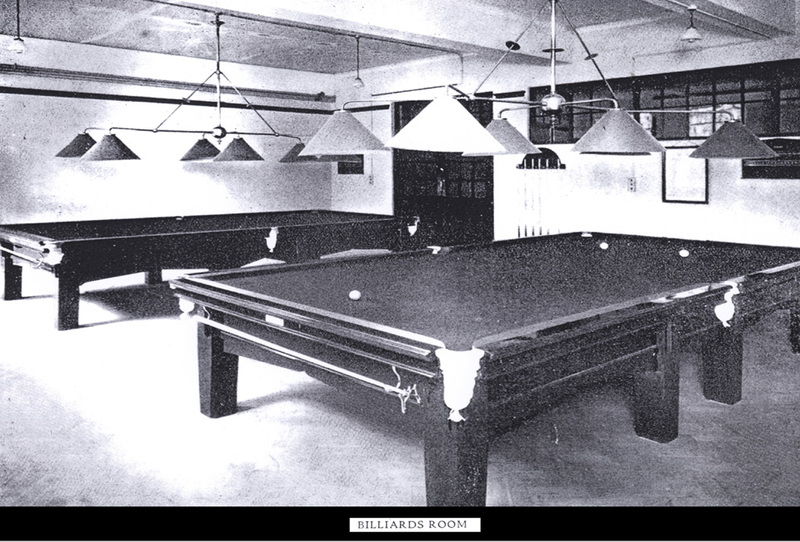 The social and recreative activities of the Polytechnic are provided for by (1) an Assembly Hall with seating accommodation for 500 persons; (2) Common Rooms for men and women; (3)Billiards Room and Club Rooms; (4) a Spacious Gymnasium, with bath and changing rooms and lockers. 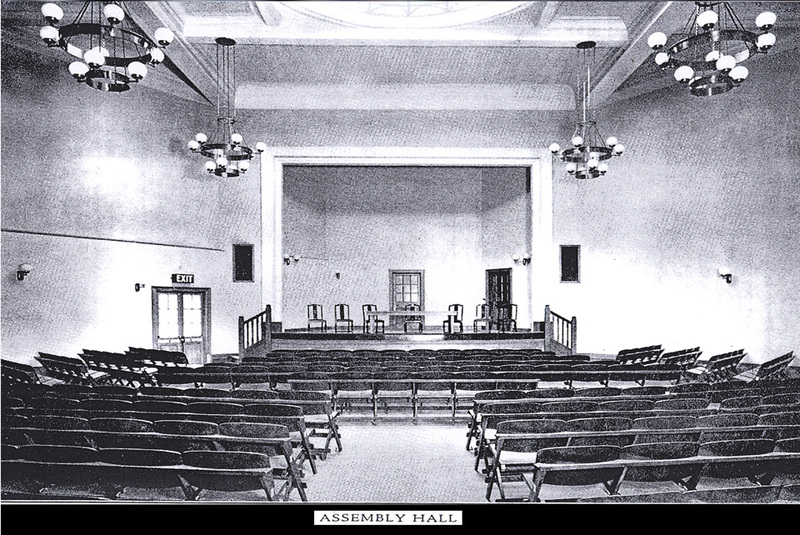 The Assembly Hall is provided with a stage. It is licensed for music and dancing, and adapted for Cinematography Entertainments. There are also Administrative Offices, a Book Store, Staff Rooms and rooms for the Principal Secretary and heads of departments; also a flat in the basement for the caretaker. There is a central low pressure, hot water heating system, with radiators throughout the building, and a separate Plenum hot air heating system for the Large Hall. Electric light and power is supplied from the St Pancras Borough Councils electric mains, and the whole of the machinery throughout the building is electrically driven. The ventilation of the classrooms is secured by steel sash frame. In the case of the Large Hall electrically driven extract fans are provided to work in con junction with the Plenum system. Mr. W. E. Riley, F.R.I.B.A., M.I.C.E., late architect to the London County Council, was responsible for the design and plans. The building is of brick and stone, and in the “Georgian” style. Messer. Nox were the contractors and the cost of the building was £97.460. The expenditure on the equipment up to the present time amounts to £22.00. A. R. BURNETT-HURST, M.SC., F.S.S. the school provides a three years course of preparatory training for boys who wish to enter one of the light engineering trades. Age of admission, 13 years. Fee £1 per term, which includes the provision of stationery, books and tools. Part time day classes for apprentices engaged in the printing trades will be held each day. The fee is 15s per session, which covers one attendance of four hours a week, with the option of attending for one evening a week. Instruction will include Composing, Linotype, Monotype Keyboard and Caster, Letterpress Machine. Fee for a course, 15s per session, for one evening a week, 10s per session. Students under the age of 18 years will be admitted at half the above fees. Students between the ages of 18-21, engaged in trade, will be admitted at half the above fees. The accommodation includes Composing Room, Machine Composing Room, Printing Machine Room, Layout Room and Design Room, Large Class Room for Theory. 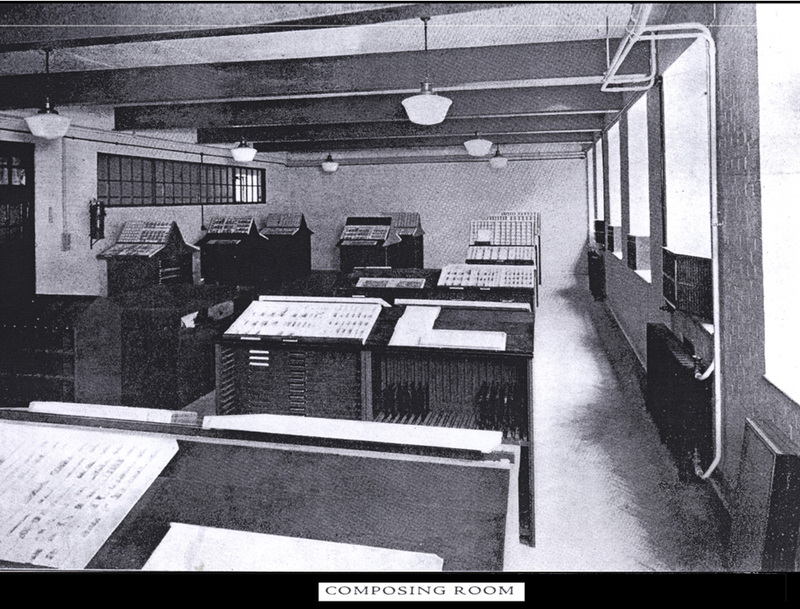 The Composing Room is fitted with steel composing cabinets, proof unit cabinets, proof press etc. 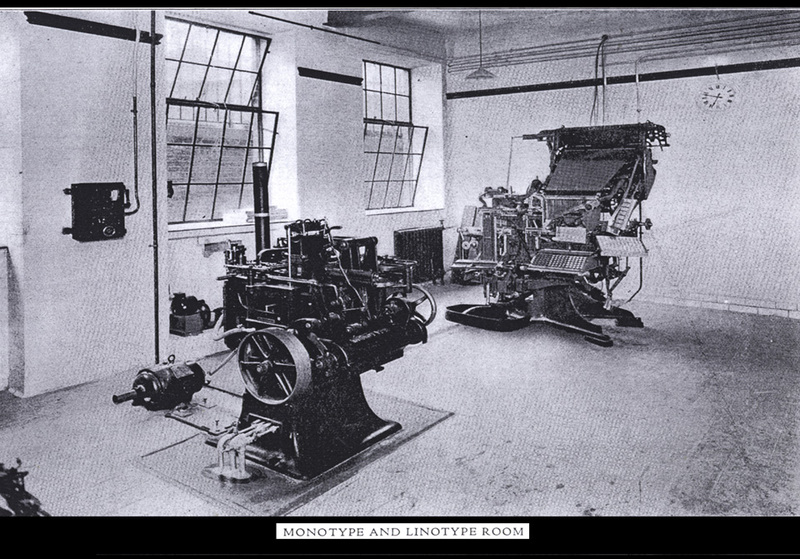 For Machine Composing, a Model 4 Linotype and Lanston Monotype Keyboards and Caster have been provided. 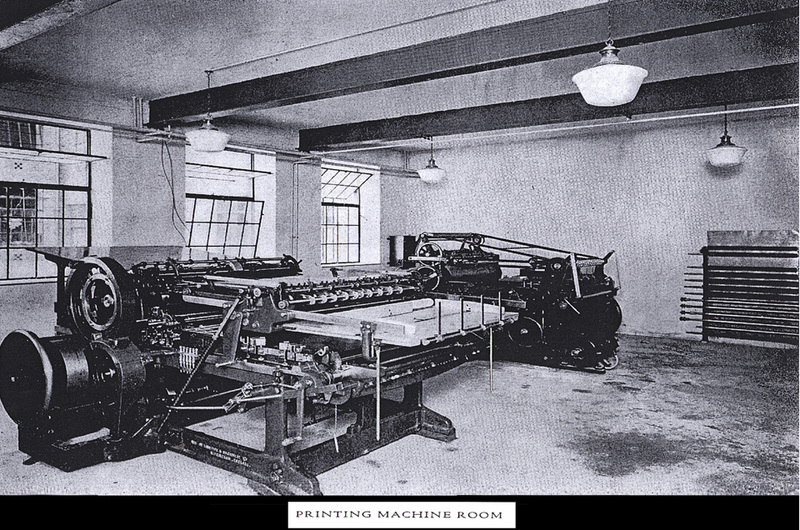 The equipment of the Printing Machine Room includes G.W. 4 Double Demy Wharfdale, No. 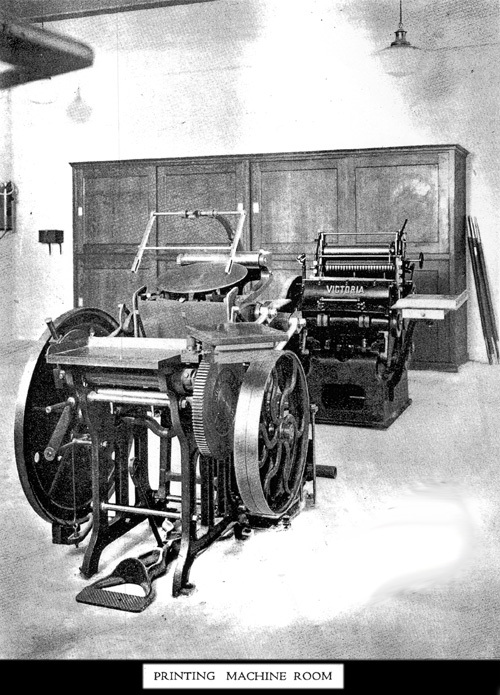 4 Double Demy Miehle, Arab Platen Crown Folio and Victoria Platen Model C Foolscap Folio machines. 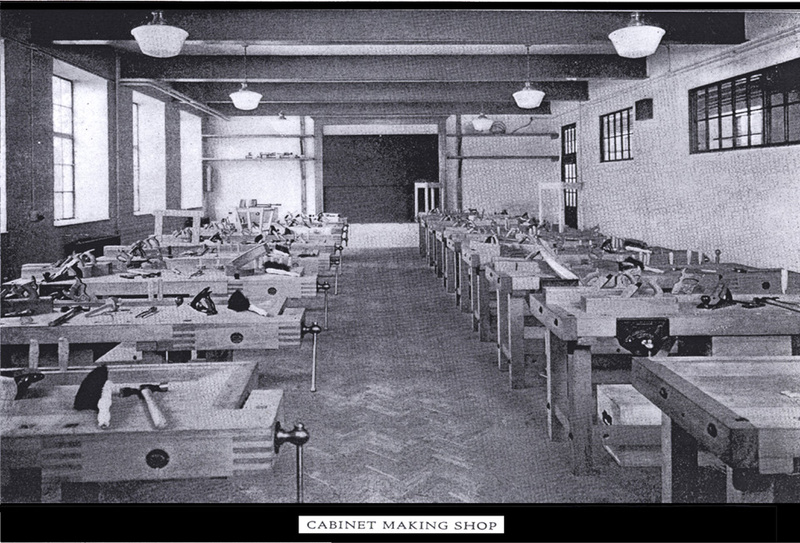 Sessional fees for Evening Classed Cabinet Making, Upholstery, and French Polishing: For a course of two or three evenings a week, 30s for the session. For one evening a week, 20s for the session. For each additional evening, 10s for the session. The Winter Session is divided in to two terms September to Christmas and Christmas to Easter. Students between 18 and 21 years of age, who produce a letter signed by their employer or forewoman, stating that they are learning a trade, will be admitted to a recognised course at half the above fees. 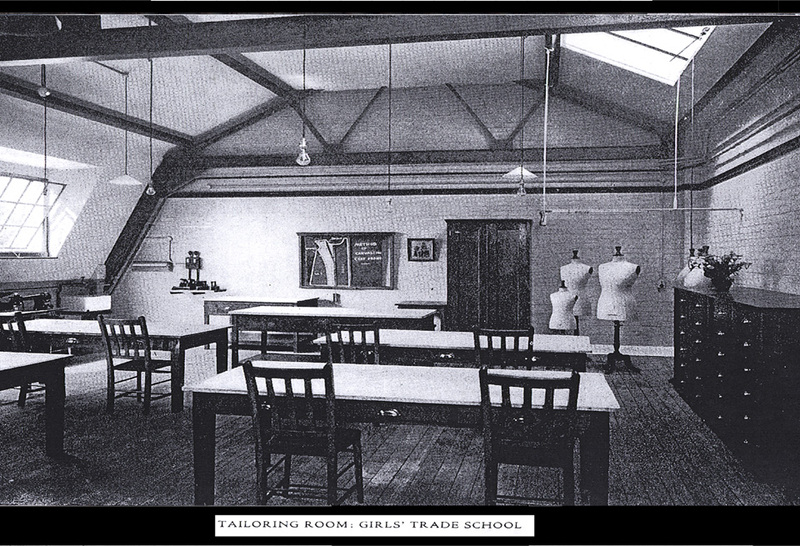 The Ladies Tailoring, Trade Millinery, Trade Cookery, Home Dressmaking, Domestic Cooker, Invalid and Convalescent Cookery, First Aid and Home Nursing, French, Art Classes, Fashion and Costume, Drawing, Embroidery, Decorating and Design, Dramatic Art, and Elocution, Choral and Orchestral Society, Gymnastic. Fees for the session. For a course 15s. For one evening a week 10s. For each additional evening 5s. Grouped courses are open to students of 17 years and over. Students under 17 years, who possess the school leaving certificate or equivalent qualification, are also admitted to the courses. Instruction is provided in Accountancy and Auditing, Economics and Statistics, Law, Shipping and Transport, The Law courses include Commercial Law, Company Law, Law relating to Income Tax, Probate and Administration, Common Law, Rights and Duties of Transport undertaking and Transport Law. The subject dealt with in the Transport section are the Economic of the Railway Transport, Modern Railways Operation, Railway Accounts, Railway Administration (Rates and Charges)elements of Traffic Working, Principles of Statistics (with special reference to transport), Transport Arrangements of a Foreign Country (1929-30 Switzerland), Railway Station Office Work (Goods and Coaching) Railway Office Routine and Electrical Engineering. Classes are also held in Bookkeeping, Business Economics, Shorthand, Typewriting and Commercial Correspondence. There is a Modern Language section for providing instruction in French, German and Spanish. In the Civil Services and General Section classes are held in Arithmetic, English Language and Literature, Geography, Mathematics and Physics. Sessional fees are 30s. For a course 20s. For one evening a week, with an extra fee of 10s. For each additional evening.